I remember seeing authentic as a hashtag on someones post a while ago and thinking that it was a strange thing to hashtag. I take back my thoughts on that, because the word keeps gaining more and more meaning to me. Maybe it’s because this time in my life is one of growth. After all, that’s what most of your twenties are. So, as I’m growing and changing and strengthening parts of me I’m trying to get down to one thing: Who I really am. The authentic Anna Katherine Oates. It’s hard to say that we weren’t authentic at one point, because we’ve always been who we are, at least, we were in that moment. The thing is though, we get influenced so much growing into adulthood. I’ve talked about how I think most childhood traits are actually a big part of who you are and will be as a person. We change a lot as we leave childhood, but our personality really just develops off those traits like building blocks. But aside from key personality traits, we change a lot in those tricky years of middle school, high school, and even college. Some of those changes are self-induced. But a lot of them are because of friends, pop culture, and simply trying to be relevant in a stage of life where we don’t seem to hold onto value easily. We change the way we dress, we change our groups of friends, we cut and dye our hair, we try some things that maybe we shouldn’t. We stray, partly because everyone is straying, but mostly because we want to be more. We haven’t always been honest about who we are, and in those stages, we’re mostly lying to ourselves. It’s part of growing up. We shouldn’t dismiss our strange stages. They’ve helped us develop into who we are today- but that’s the question, who are you today? When I first picked this one up I decided that I probably wouldn’t review it, then as I started reading I decided I should post it with some stupid disclaimer about how I “don’t usually read self-help books.” But now that I’ve finished it, I feel like I should state: If this is what self -help or self-improvement books are all like, then I should read one a week. Graduation is hard on friendships. It’s hard because the ones you have scatter, and finding new ones is a lot more complicated then it was. We’ve been in school all our lives. We’ve always had pools of similarly-aged people to form relationships with. It’s honestly amazing when you think about it. Now you can meet people at work in the same way. You can become great friends with co-workers. But they aren’t always in the same walk of life as you, and while that doesn’t mean you won’t be close, it does mean that you might need to find those people who are elsewhere. Life has been a little crazy lately- not that I really expected anything different. Graduating college and being thrown into the real world can jolt anyone. It feels like I’ve been out longer than a month and a half. I can’t tell if that’s because it has been so good or so stressful, because as it turns out, stress and goodness can come at once. I’m not exactly working a full time job, and by that, I mean I’m not. I’m currently working two part time jobs. One of these is in the field I want to be in (social media and PR- go figure) and I’m really loving the opportunity and I feel so blessed to have been offered it. There also might be a possibility of a full time job coming out of one of these part times, which would be a dream. 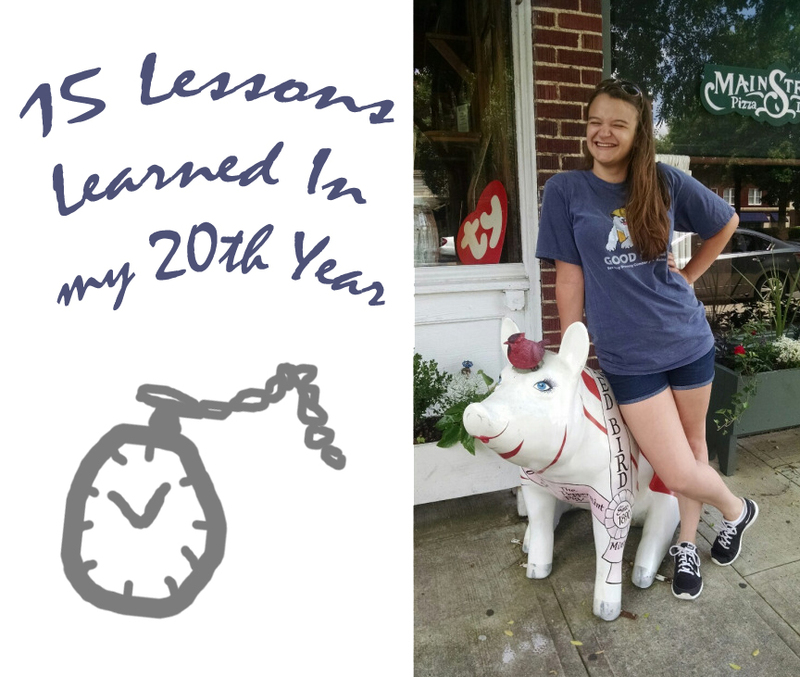 I was featured on Young & Twenty and was told I could share the post on my own personal blog! The link to it is here if you want to see the rest of the collection. I’m turning 22 next week. I just graduated from college. I’m jobless – and to be honest – really unsure of where I’m going to end up. I read just about every advice blog post put in front of me, and just about all of them are trying to tell me to drop everything and go on some life changing adventure. It’s amazing how one facebook message can launch you into a friendship that’s been dormant for seven years. We play the “I’m just going to stop texting people and see who reaches out to me” and pretend like it tells us who is really in our lives for good. It doesn’t. It tells you who’s busy, or it tells you who is waiting on you to text first to see if you care. Stop being a child. Reach out. If you aren’t educated in a topic it’s okay to say that. Don’t try to keep up the fight just because you have an opinion. My body shape doesn’t actually matter that much- how far I can run when the dog takes off and how I sleep at night do. Health and image aren’t the same. We’re young, things don’t work out. That doesn’t mean that we’re doing anything wrong. Sometimes you have to go on a few dates before you realize what you’re looking for. Sometimes you can just go out to dinner with a guy just to see. It’s okay, the next boy you date doesn’t have to be your future husband. Taking much needed down time and being lazy are two very different things. When you get older you start to realize you’ve been lying about your days “off”. Don’t you have something you’ve wanted to do but “hadn’t have the time to do”? Dream big, reach for the stars, but keep in mind that you should also have plans for the time in between dreams, the steps to get there. Transitions should be enjoyed also. A lot of life is spent in transition anyways. I look fine when I smile with my teeth, no matter what I’ve spent my life telling myself. And if someone gets a bad picture of me smiling with my teeth? That’s okay too, people on facebook have seen me in person, the people on here and tumblr who haven’t? They don’t actually care if I put out one bad picture for every 20 glossy ones. It’s how I look. Not flawless like Beyonce but damn good looking anyways. Study the masters. Of anything that you want. Learn everything you can from everything. You never should aim to “finish” your studies. Buy it in Print. Cook books, magazines, novels. Drip on the cookbook pages, rip out magazine articles, write in margins of novels. You’ll retain more. You’ll love it and won’t “click away”. Indulge. They’re only guilty pleasures if you feel bad about them- which you shouldn’t. I spent years not speaking of my accomplishments because I didn’t want to brag. I thought the line was too thin to walk, but it isn’t. Show your skills or knowledge when on the correct topic for it and only mention it a few times through out the year. People can know you’re great at something without you being annoying about it. Don’t wait- Don’t put your life on hold. Things can be moved to the back burner, but you should never just be sitting around waiting for a call from him or that call from that dream job you applied to two months ago and never heard from. Dance alone, in public. Embarrass yourself every now and then. It’s how you have fun and learn that you shouldn’t be embarrassed by that anyways. Spend time with toddlers and puppies, you’ll understand why when you want to rip you hair out, then again when you see the beauty in it all. It’s something everyone should learn. Thank them. Do it again. And again. Never forget to say I love you. Never let someone think they aren’t important to you.